Your Android device comes with a basic set of fonts. They are just Plain and Bold fonts. Some users feel they are boring. It makes their device looks dull. There are many attractive fonts available on the internet which you want to try on your device. It will give your Android device a refreshing look. 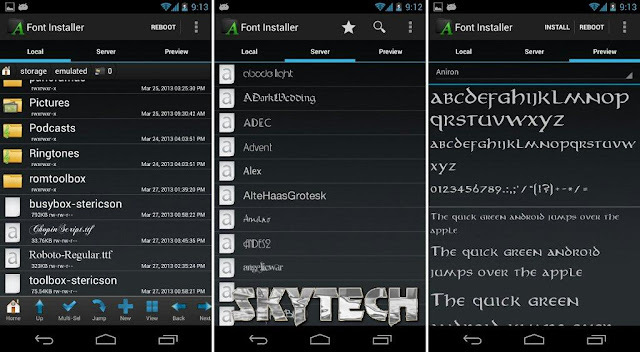 To install a TTF font on your Android device just follow our simple guide to change the fonts but only for Root users. 2. Start the Font Installer app. 3. Click on the Menu option (three dots) and select Backup/Restore . Select Backup(To backup original one) . If asked for Superuser or SuperSU permissions, grant it. 4. Click on the Local tab to and locate your TTF font. 6. Grant the Superuser or SuperSU asks for permission, . 7. Font Installer will ask you to reboot. your device. Select Yes. Now you have successfully changed your device font..! !